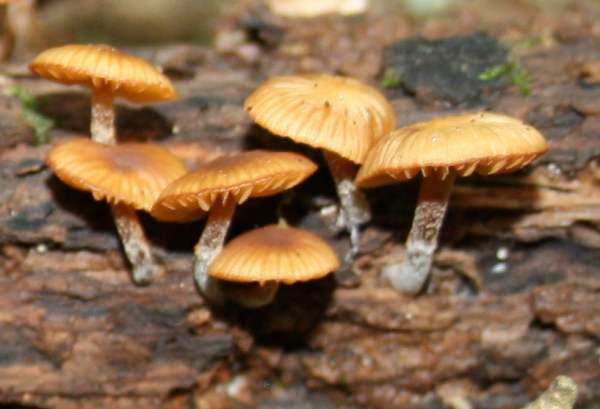 This pretty Galerina graminea, with its widely-spaced gills and dark-centred orange caps, is easily mistaken for one of the smaller rustgills, Gymnopilus species, but its widely-spaced gills and lined cap margins are important distinguishing features. 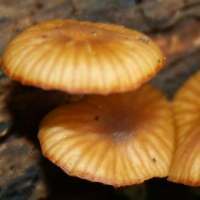 Galerina heimansii is a rare find in Britain and Ireland. This species is also recorded, albeit rarely, in parts of mainland Europe including Denmark, Germany, Holland and France. This attractive little mushroom was first described scientifically in 1969 by South-African born Dutch mycologist Albert Marinus Franciscus (Bert) Reijnders (1899 - 2002), who gave it the scientific name Galerina heimansii by which it is generally known today. I know of no synonyms of Galerina heimansii. Galerina means 'like a helmet', while the specific epithet heimansii honours a Dutch botanist (I belive) Jacob Heimans (1889 - 1978). 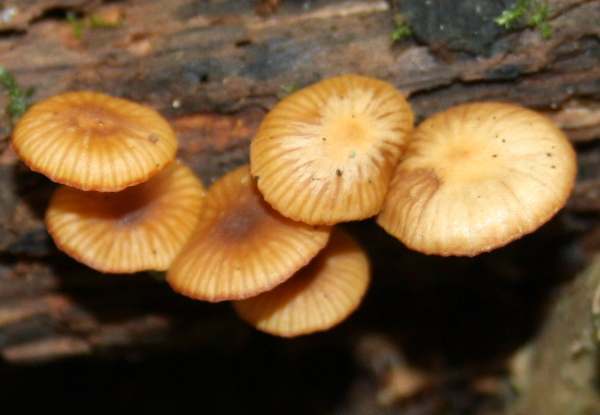 Many common Galerina species are described as either inedible or suspect while some - for example Galerina marginata - contain deadly poisonous amatoxins which are the same kinds of substances that make the Deathcap Amanita phalloides so dangerous. Galerina heimansii is a rare find, and so there are surely more than sufficient reasons for not gathering this species to eat. 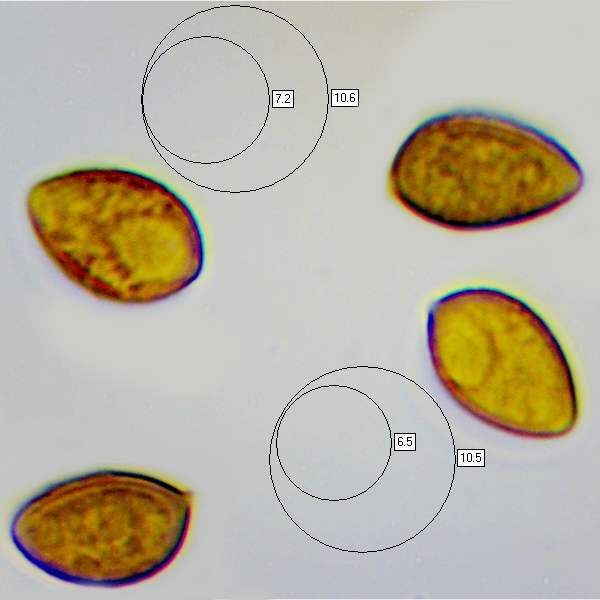 Initially conical or campanulate, becoming broadly convex, centre sometimes becoming slightly depressed but with a narrow central umbo; orange with a darker red-brown centre; strongly lined or grooved radially up to 3/4 from margin towards centre; 5 to 10mm in diameter when fully expanded. Widely spaced, distant; ochraceous becoming more orange as the spores mature; adnate to adnexed. Basidia 2-spored. Cheilocystidia and pleurocystidia thick-walled, flask shaped 35-60 x 12-20μm. 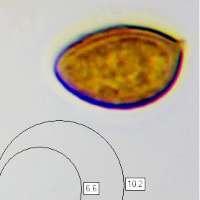 1 to 1.5mm in diameter and 1.5 to 2cm tall; cylindrical or tapering slightly upwards from a slightly bulbous base, beige-orange and floury near apex; darker brown below then white and longitudinally fibrillose at the base. Ellipsoidal to almond shaped, 8-10.5 x 5-6μm; finely warty. Indistinct or slightly raphanoid (of radish). Most often in carr woodland on rotten wood, usually alder Alnus spp. ), willow (Salix spp.) or birch (Betula spp.) or on wet soil in swampy land. Early spring - early winter. Kuehneromyces mutabilis, a much larger mushroom with a pale cap centre and a darker margin. Flammulina velutipes, commonly called Velvet Shank, has a darker, velvety stem and leaves a white spore print. 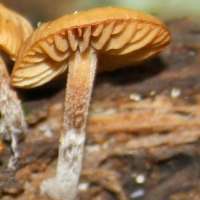 Galerina marginata is larger and has a mealy smell and a much less striate cap; it is deadly poisonous.